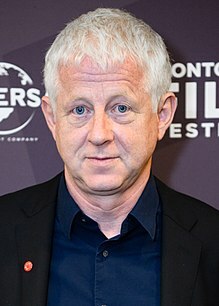 For other people named Richard Curtis, see Richard Curtis (disambiguation). Richard Whalley Anthony Curtis, CBE (born 8 November 1956), is a British screenwriter, producer, and film director. One of Britain's most successful comedy screenwriters, he is known primarily for his romantic comedy films, among them Four Weddings and a Funeral (1994), Notting Hill (1999), Bridget Jones's Diary (2001), Love Actually (2003), and About Time (2013). He is also known for the drama War Horse (2011), and for having co-written the hit sitcoms Blackadder, Mr. Bean, and The Vicar of Dibley. In 2007, Curtis received the BAFTA Academy Fellowship Award, the highest award given to a filmmaker by the British Film Academy (BAFTA). At the 2008 Britannia Awards, Curtis received the BAFTA Humanitarian Award for co-creating Comic Relief and for his contributions to other charitable causes. In 2008, he was ranked number 12 in a list of the "100 most powerful people in British culture" compiled by The Telegraph. In 2012, Curtis was one of the British cultural icons selected by artist Sir Peter Blake to appear in a new version of his most famous artwork—the cover of The Beatles' album Sgt. Pepper's Lonely Hearts Club Band. Curtis is the co-founder, with Sir Lenny Henry, of the British charity Comic Relief, which has raised in excess of £1 billion. Curtis was born in Wellington, New Zealand. He is the son of Glyness S. and Anthony J. Curtis. His father was a Czechoslovakian refugee who moved to Australia when aged thirteen and became an executive at Unilever. Curtis and his family lived in several different countries during his childhood, including Sweden and the Philippines, before moving to Great Britain when he was 11. Curtis attended Papplewick School, Ascot, Berkshire (as did his younger brother Jamie). For a short period in the 1970s, Curtis lived in Warrington, Cheshire, where he attended Appleton Grammar School (now Bridgewater High School), before he won a scholarship to Harrow School, where, as head boy, he abolished fagging. He achieved a first-class Bachelor of Arts in English Language and Literature at Christ Church, Oxford. At the University of Oxford, Curtis met and began working with Rowan Atkinson, after they both joined the scriptwriting team of the Etceteras revue, part of the Experimental Theatre Club. He appeared in the company's "After Eights" at the Oxford Playhouse in May 1976. Collaborating with Rowan Atkinson in the Oxford Revue, he appeared alongside him at his breakthrough Edinburgh Fringe show. As a result of this, Curtis was commissioned to co-write the BBC Radio 3 series The Atkinson People with Atkinson in 1978, which was transmitted in 1979. He then began to write comedy for film and TV. He was a regular writer on the TV series Not the Nine O'Clock News, where he wrote many of the show's songs with Howard Goodall and many sketches, often with Rowan Atkinson. Curtis was the co-writer with Philip Pope of the Hee Bee Gee Bees' single "Meaningless Songs (In Very High Voices)" released in 1980 to parody the style of a series of Bee Gees' disco hits. First with Atkinson, and later with Ben Elton, Curtis then wrote the Blackadder series from 1983 to 1989, each season focusing upon a different era in British history. Atkinson played the lead throughout, but Curtis remains the only person to have been a writer for every episode of Blackadder. The pair continued their collaboration with the comedy series Mr. Bean, which ran from 1990–1995. Curtis had by then already begun writing feature films. His first was The Tall Guy in 1989. The romantic comedy starred Jeff Goldblum, Emma Thompson and Rowan Atkinson and was produced by Working Title films. The TV movie Bernard and the Genie followed in 1991. In 1994, Curtis created and co-wrote The Vicar of Dibley for comedian Dawn French, which was a great success. In an online poll conducted in 2004 Britain's Best Sitcom, The Vicar of Dibley was voted the third best sitcom in British history and Blackadder the 2nd, making Curtis the only screenwriter to have created two shows within the poll's top 10 programmes. Curtis achieved his breakthrough success with the romantic comedy Four Weddings and a Funeral. The 1994 film, starring Hugh Grant and Andie MacDowell, was produced on a limited budget by the British production company Working Title Films. Curtis chose Mike Newell to direct the film after watching his TV film Ready When You Are, Mr. McGill. Four Weddings and a Funeral proved to be the top-grossing British film in history at that time. It made an international star of Grant, and Curtis' Oscar nomination for the script catapulted him to prominence (though the Oscar went to Quentin Tarantino and Roger Avary for Pulp Fiction). The film was also nominated for Best Picture, but lost to Forrest Gump. Curtis' next film was also for Working Title, which has remained his artistic home ever since. 1997's Bean brought Mr. Bean to the big screen and was a huge hit around the world. He continued his association with Working Title writing the 1999 romantic comedy Notting Hill, starring Hugh Grant and Julia Roberts, which broke the record set by Four Weddings and a Funeral to become the top-grossing British film of all time. The story of a lonely travel bookstore owner who falls in love with the world's most famous movie star was directed by Roger Michell. Curtis next co-wrote the screen adaptation of the international bestseller Bridget Jones's Diary for Working Title. Curtis knew the novel's writer Helen Fielding. Indeed, he has credited her with saying that his original script for Four Weddings and a Funeral was too upbeat and needed the addition of the titular funeral. Two years later, Curtis re-teamed with Working Title to write and direct Love Actually. Curtis has said in interviews that the sprawling, multi-character structure of Love Actually owes a debt to his favourite film, Robert Altman's Nashville. The film featured a "Who's Who" of UK actors, including Hugh Grant, Colin Firth, Bill Nighy, Emma Thompson, Liam Neeson, Andrew Lincoln, Alan Rickman and Keira Knightley, in a loosely connected series of stories about people in and out of love in London in the weeks leading up to Christmas. Curtis followed this in 2004 with work as co-writer on Bridget Jones: The Edge of Reason, the sequel to Bridget Jones's Diary. Curtis then wrote the screenplay to The Girl in the Café, a television film directed by David Yates and produced by the BBC and HBO as part of the Make Poverty History campaign's Live 8 efforts in 2005. The film stars Bill Nighy as a civil servant and Kelly Macdonald as a young woman he falls in love with at a fictional G8 summit in Iceland. Macdonald's character pushes him to ask whether the developed countries of the world cannot do more to help the most impoverished. The film was timed to air just before the Gleneagles G8 summit in 2005. It received three Emmy Awards in 2006, including Outstanding Made for Television Movie, Supporting Actress in a Miniseries or a Movie for Kelly Macdonald, and a Primetime Emmy Award for Outstanding Writing for a Miniseries, Movie or a Dramatic Special trophy for Curtis himself. Curtis said of Yates' direction that he made "a much more beautiful film, and a surprising film and a better film than I could possibly have made." In May 2007, he received the BAFTA Fellowship at the British Academy Television Awards in recognition of his successful career in film and television and his charity efforts. Curtis next co-wrote with Anthony Minghella an adaptation of Alexander McCall Smith's novel, The No. 1 Ladies' Detective Agency, which Minghella shot in mid-2007 in Botswana. It premiered on the BBC on 23 March 2008, just days after Minghella's death. The film did not run in the US until early 2009, when HBO aired it as the pilot of a resulting six-episode TV series with the same cast, on which Curtis served as executive producer. His second film as writer/director, The Boat That Rocked, was released in 2009. The film was set in 1966 in the era of British pirate radio. It followed a group of DJs on a pirate radio station run from a boat in the North Sea. The film starred Philip Seymour Hoffman, Bill Nighy, Nick Frost, Rhys Ifans, Gemma Arterton and Kenneth Branagh. The film was a commercial and critical disappointment in the UK. Curtis re-edited the film for its US release where it was re-titled Pirate Radio, but also failed to find an audience. He followed that with War Horse, which he rewrote for director Steven Spielberg based on an earlier script by playwright Lee Hall. Curtis was recommended to Spielberg by DreamWorks Studio executive Stacey Snider, who had worked with Curtis during her time at Universal Studios. Curtis's work on the World War I-set Blackadder Goes Forth meant he was already familiar with the period. Curtis then wrote Mary and Martha, a BBC/HBO television film directed by Phillip Noyce. The film starred Hilary Swank and Brenda Blethyn as two women who bond after they both lose their sons to malaria. The film was broadcast in the UK on 1 March 2013. His next wrote and directed About Time, a romantic comedy/drama about time travel and family love. It starred Rachel McAdams, Domhnall Gleeson, Bill Nighy, Tom Hollander, Margot Robbie, Lydia Wilson and Vanessa Kirby. It was released in the UK on 4 September 2013. Soon after the film came out, Curtis delivered a screenwriting lecture as part of the BAFTA and BFI Screenwriters' Lecture Series. He followed that with Trash, which he adapted from the novel by Andy Mulligan for director Stephen Daldry. With three unknown Brazilian children in the lead roles, the film co-starred Wagner Moura, Rooney Mara and Martin Sheen. It was filmed in 2013 in Rio de Janeiro and released in Brazil on 9 October 2014 and in the UK on 30 January 2015. He next wrote Roald Dahl's Esio Trot, a BBC television adaptation of Roald Dahl's classic children's novel. The film starred Dustin Hoffman and Judi Dench, was directed by Dearbhla Walsh and was broadcast on BBC on 1 January 2015. His next film, Yesterday, directed by Danny Boyle and starring Lily James and Himesh Patel, follows a young man who discovers that the entire world except for him has no memory of The Beatles, allowing him to become a global pop star by performing their songs as his own. It began filming on 21 April 2018 and will be released on June 28, 2019. Curtis together with Lenny Henry are co-founders and co-creators of Comic Relief and Red Nose Day. Curtis is also a founder of Make Poverty History. He organised the Live 8 concerts with Bob Geldof to publicise poverty, particularly in Africa, and pressure G8 leaders to adopt his proposals for ending it. He has written of his work in The Observer in the Global development section in 2005. He talked the producer of American Idol into doing a show whereby celebrities journey into Africa and experience the level of poverty for themselves. The show was called American Idol: Idol Gives Back. In 2014, Curtis publicly backed "Hacked Off" and its campaign in support of UK press self-regulation by "safeguarding the press from political interference while also giving vital protection to the vulnerable." In August 2014, Curtis was one of 200 public figures who were signatories to a letter to The Guardian opposing Scottish independence in the run-up to September's referendum on that issue. In October 2010, a short film created by Curtis titled No Pressure was released by the 10:10 campaign in Britain to promote climate change politics. The film depicted a series of scenes in which people were asked if they were going to participate in 10:10 campaign, told there was "no pressure" to do so, but if they did not, they were blown up at the press of a red button. Reaction was mixed, but the video was swiftly removed from the organisation's website. In March 2011, Curtis apologised following a complaint by the British Stammering Association about 2011 Comic Relief's opening skit, a parody by Lenny Henry of the film The King's Speech. Curtis lives in Notting Hill and has a country house in Walberswick, Suffolk with script editor and broadcaster Emma Freud. He previously dated Anne Jenkin, now Baroness Jenkin of Kennington, before her marriage to Sir Bernard Jenkin, MP. 2009 The Boat That Rocked Yes Yes executive Titled Pirate Radio in the U.S.
2010 Doctor Who No Yes No Episode: "Vincent and the Doctor"
^ "Britannia Award Honorees – Awards & Events – Los Angeles – The BAFTA site". British Academy of Film and Television Arts (BAFTA). Retrieved 31 July 2012. ^ "BBC News – Comic Relief raises £1bn over 30-year existence". BBC News Online. 14 March 2015. Retrieved 18 March 2015. ^ "Emma Freud tells her Dad's refugee story". YouTube. 11 June 2014. ^ "How Blackadder changed the history of television comedy". The Indelendent. 5 October 2016. ^ a b "Richard Curtis: Screenwriting Lecture". BAFTA Guru. 30 September 2013. Retrieved 18 August 2015. ^ "Television │ Fellowship in 2007 – Winner: Richard Curtis CBE". BAFTA. Retrieved 18 August 2015. ^ Thomas, Archie (18 May 2007). "British acad to honor Curtis – Scribe wrote 'Vicar of Dibley,' 'Girl in the Cafe'". Variety. Retrieved 15 October 2012. ^ Oliver Lyttelton (19 January 2012). "'Four Weddings' & 'Love Actually' Mastermind Richard Curtis – The Playlist". The Playlist. Retrieved 20 January 2015. ^ "It's 'About Time' For Rachel McAdams & Richard Curtis; Actress Lines Up Anton Corbijn's 'A Most Wanted Man' | The Playlist". Blogs.indiewire.com. Archived from the original on 13 May 2012. Retrieved 11 March 2013. ^ "Richard Curtis Delivers his BAFTA Screenwriters' Lecture". BAFTA. 30 September 2013. Retrieved 24 October 2013. ^ Child, Ben (6 April 2011). "Stephen Daldry and Richard Curtis pick up Trash". The Guardian. London. ^ "BBC News – Irish director Dearbhla Walsh to direct Roald Dahl film". BBC News. Retrieved 20 January 2015. ^ "Lily James in Talks to Star in Danny Boyle Comedy (Exclusive)". Hollywood Reporter. Retrieved 2 October 2018. ^ ""We began shooting our new movie today."". Twitter.com. 21 April 2018. Retrieved 2 October 2018. ^ Curtis, Richard (24 April 2005). "Place your cross for Africa's Aids orphans _ Global development". The Observer. Retrieved 8 June 2013. ^ "Benedict Cumberbatch, Alfonso Cuaron, Maggie Smith Back U.K. Press Regulation". Hollywoodreporter.com. 18 March 2014. Retrieved 26 August 2014. ^ Ian Burrell (18 March 2014). 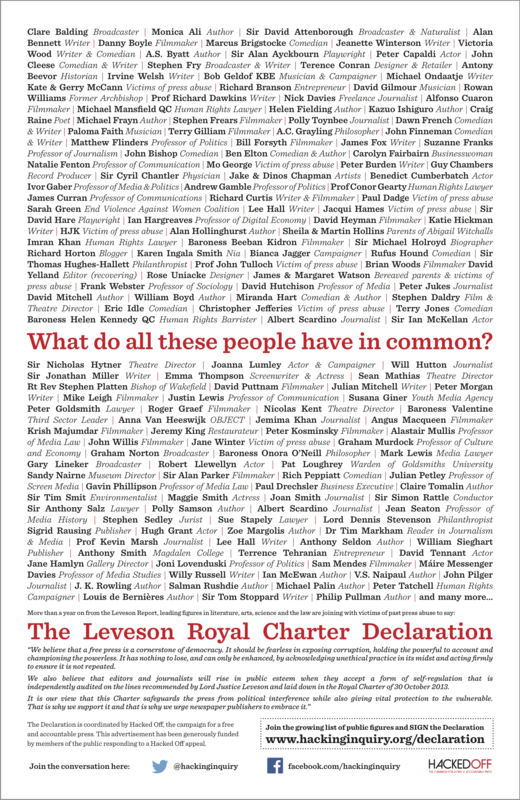 "Campaign group Hacked Off urge newspaper industry to back the Royal Charter on press freedom – Press – Media". The Independent. Retrieved 26 August 2014. ^ Vaughan, Adam (7 October 2010). "No Pressure: the fall-out from Richard Curtis's explosive climate film". The Guardian. London. Retrieved 7 October 2010. ^ "'Speech' stammer spoof under fire". Toronto Sun. 22 March 2011. Retrieved 22 March 2011. ^ Thorpe, Vanessa (27 March 2005). "The producer". The Guardian. UK. Retrieved 8 October 2007. ^ "TV & Radio Presenter Emma Freud". BBC. Archived from the original on 4 June 2006. Retrieved 20 January 2013. Wikimedia Commons has media related to Richard Curtis.